The New York Military Academy Boys Tennis Team continued their winning ways beating Darrow this past Saturday afternoon and moving to 3-1 for the year. Matthew Montes started the team off with an 8-1 victory. Simon Lin won in the 2nd singles position 8-4 and Adam Sun continued his undefeated season with an 8-1 victory at 3rd. Jeffrey Li played his first singles match of the season in the 4th spot and won 8-1. Matthew Montes and Simon Lin finished the match off with a 6-0 doubles win. The Boys Tennis Team then moved to 4-1 for the season Monday afternoon with an impressive victory over Oakwood Friends School. 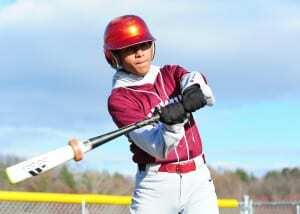 Matthew Montes led the team with a commanding 10-1 victory. Brandon Fooks won 10-2 at 2nd singles and Simon Lin won 10-5 in the 3rd spot. Boys Tennis “Youngest Man” Adam Sun also continued his undefeated singles campaign with a 10-5 win at 6th singles. At 1st doubles Montes and Lin won 8-3 while Fooks and Sun battled to get a 9-8 (7-5) win in the 2nd doubles position. 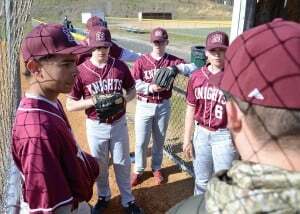 On Friday, April 20th the Knights took to the diamond to face Marvelwood. After a two-hour windy contest NYMA lost 5-7. It was a great game and the runs batted-in really gave our team a morale boost. Cadet Racine had a 98-pitch game that led to four strikeouts. 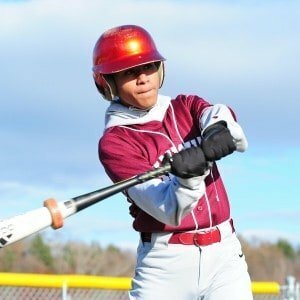 Jamel Pauletta showed his leather skills in the field with some wonderful plays that led to 3 outs. We are coming together as a newly formed team and the outlook is great. The cadets are excited to play this week but had a cancellation on Wednesday due to weather; that game has been rescheduled. 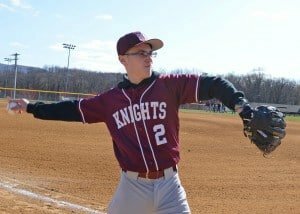 The Knights will take on Storm King School on Friday, April 27th at Mt. Airy in Cornwall and then travel to Marvelwood for a rematch on Saturday, April 28th. 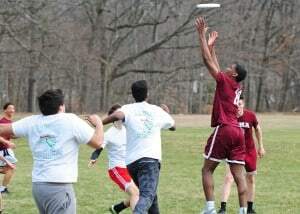 On Monday, April 23rd the Knights Ultimate Frisbee Team hosted their cross-town rivals from Storm King School in a high-energy, competitive game. Thanks to smart decisions and skillful play from handlers Nigel Petti-Fernandez and Daniel Geng, the Knights offense jumped out to an early lead. Hard-working defensive play by cadets Andrew Weng, Jake DeBree, Kris Wu, and others slowed the Storm King offense and led to a hard-earned 8-4 NYMA lead at halftime. The cadets’ hustle and teamwork led to more success in the second half as nine different cadets were involved on scoring plays…a new team best! The Knights went on to win 15-10 in their most impressive team victory so far. On Wednesday, April 25th the Ultimate Frisbee Team traveled north to Oakwood Friends School to play their first road game of the season on a very windy and rainy day. The Knights hustled and traded points with their opponents early. Team captain and primary handler, Nigel Petti-Fernandez, found success connecting with cadets Will Mayfield, Andrew Weng, Alvin Lukose, and others. Both offenses struggled to gain ground in the difficult weather conditions, but hard defensive work led to many long, hard-fought points. Cadets Wang, Petti-Fernandez, and Geng gave great defensive efforts throughout the game. Unfortunately, the Knights suffered too many turnovers, including several in the end-zone as the disc was harder to handle in the rain. The cadets rebounded from an Oakwood run and put forth a strong effort at the end of the game, but lost by the final score of 4-15. The Knights will learn from this first rainy-day experience as they look forward to the rest of their schedule! Next Next post: Vote for Serena!